First Monday of each month (times may vary July-September) at convenient locations. Visit our calendar for the latest schedule. 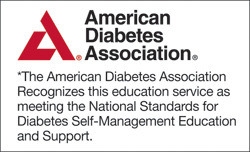 Medicare and many insurance companies cover the cost of diabetes education, but a referral from your physician or nurse practitioner is required. We recommend you verify whether services are covered by your insurance plan. For more information or to make an appointment, send email to DiabetesTreatmentServices@SMH.com or call 941-917-7468.